Michael T J Wride was born in Torquay. His family moved to Exeter when he was a baby, and he still lives in his childhood home. He started taking photographs with a Kodak box camera–in 1960 he acquired a 35mm Ilford Sportsman camera, with which he took these photographs. 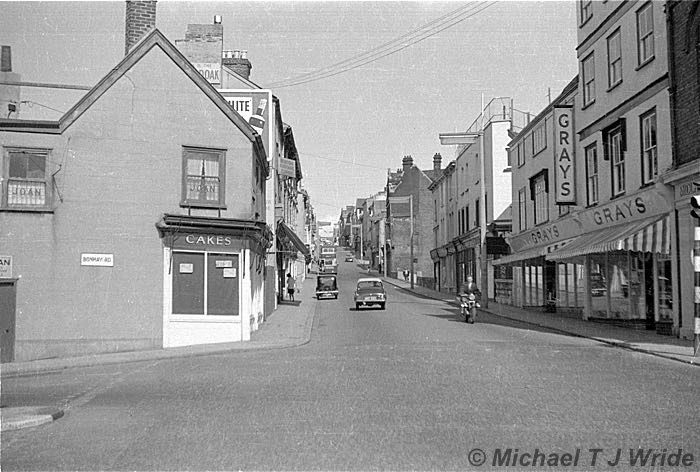 The early 1960s were a time of mass demolition in the city, and many of Exeter's streets have disappeared, or radically changed. This is the first time these photographs have been published. They are all copyright and not for use elsewhere. Looking away from the Exe Bridge towards Alphington. Pikes Garage can be seen at the end. The same view of Alphington Street, from the opposite side of the road. Looking up North Street. 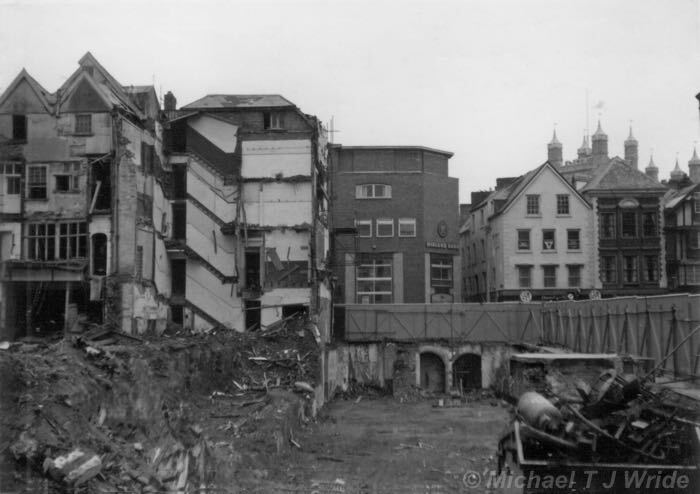 The left side is now the boundary of the Guildhall Centre. Many interesting and historic buildings were lost in the fredevelopment, including the Elephant Inn. Looking down North Street. 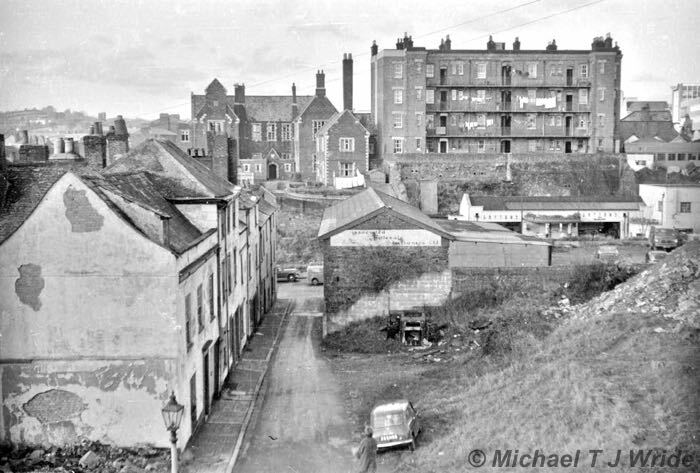 The right hand side was demolished below Waterbeer Street for the Giuildhall Centre. 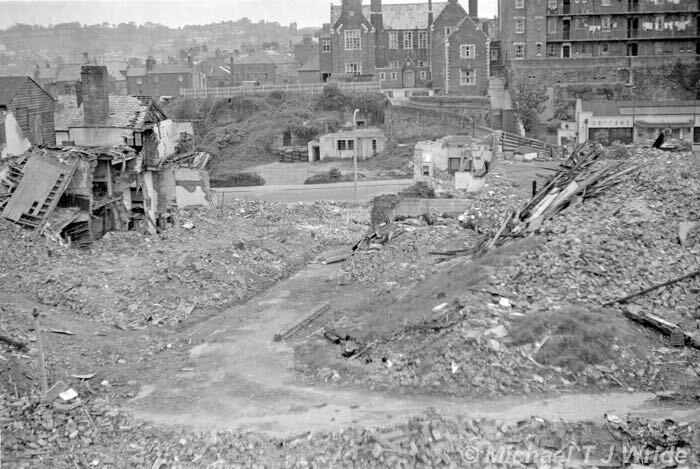 Looking towards the Eye Hospital (Magdalen Chapter Hotel) this is after the Valiant Soldier had been demolished prior to the development of the Acorn Roundabout. The shops aon each side were still trading. 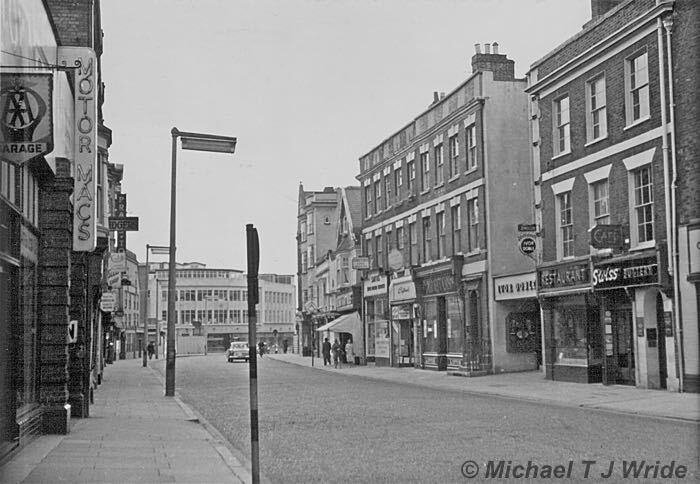 This is almost the same view as the photo on the left–the many businesses in the street have been closed, prior to redevelopment. Looking towards Topsham. The modern day Globe Backpackers is centre right behind the car. The left hand side, with the Weymouth Arms, is now part of the South Street roundabout. Photographed from some waste ground below the Globe Packbackers, looking towards Topsham. Larkbeare House is on the left hand side, behind some petrol station signs. Situated off New Bridge Street, and running parallel with Bartholomew Street, Rackplace Close is unchanged until you walk 50 yards up it. 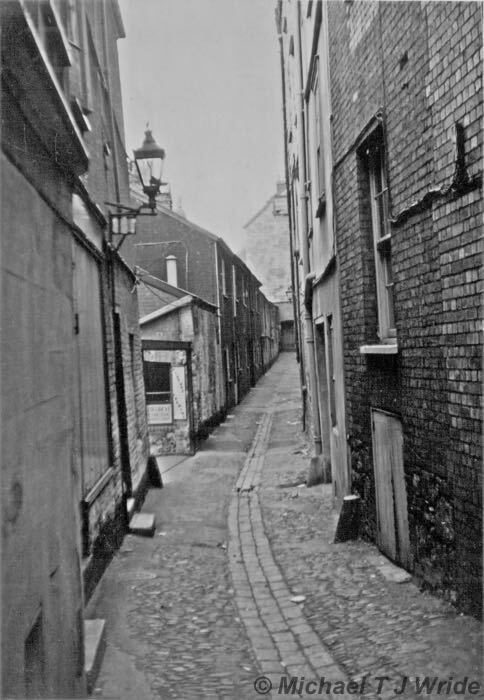 In this view, the rear of the now demolished Beedles Terrace is on the left, beyond the lamp. Another old street that has little changed from 1961 and before. Exeter's first Bernie Inn the Hole in the Wall is situated in Little Castle Street. 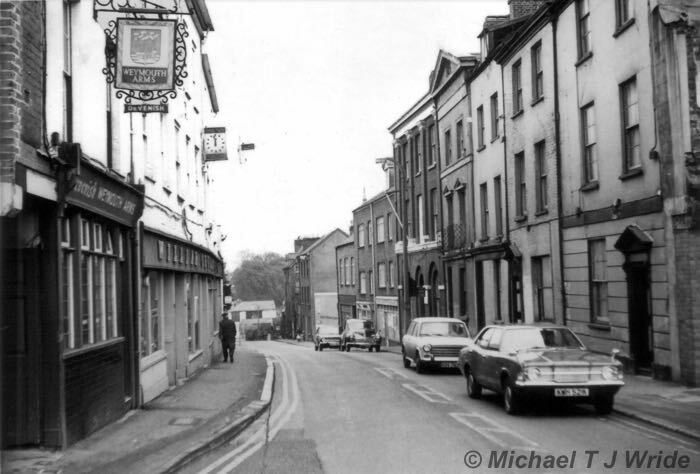 Before the mid 18th Century, Little Castle Street was the main route up to Rougemont Castle. 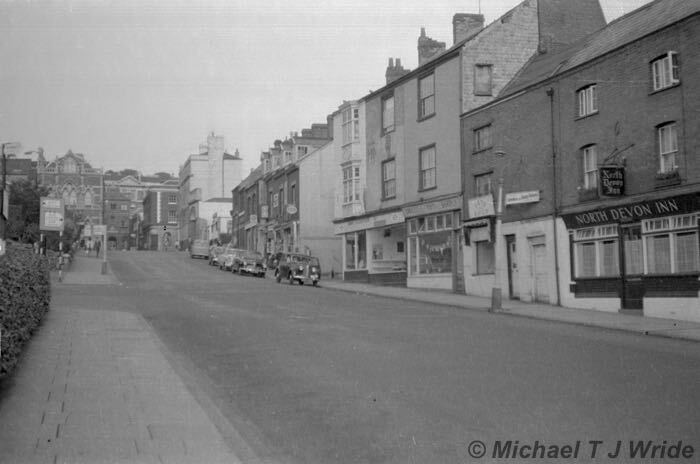 The right hand side of Paul Street before the demolition ball did its work. The left side was the Paul Street bus station at this time. Now Paul Street is a hidious brick and concrete canyon, distinguished, for many, by the long wait to enter the over expensive carpark for the Guildhall Centre. 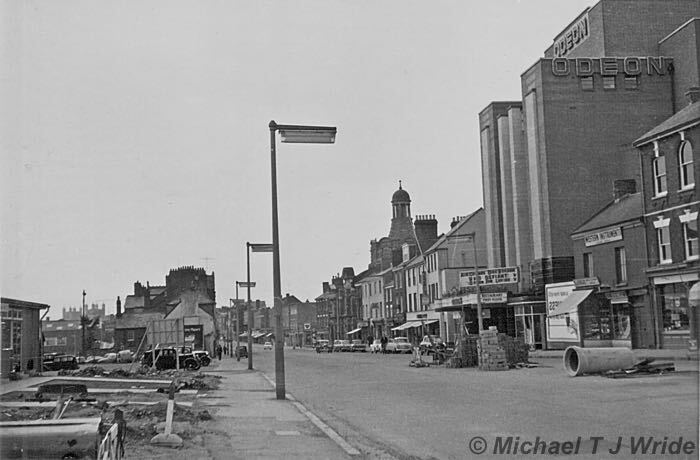 What was known as Boots corner, although Webbers now occupied the site, just before demolition. Demolition of Boots corner for C and A from Little Queen Street. The area behind the undemolished buildings was the printworks for the Western Times and Express and Echo. The whole block on the left was demolished for the new build, C and A. Now it is Tescos and Sports Direct. 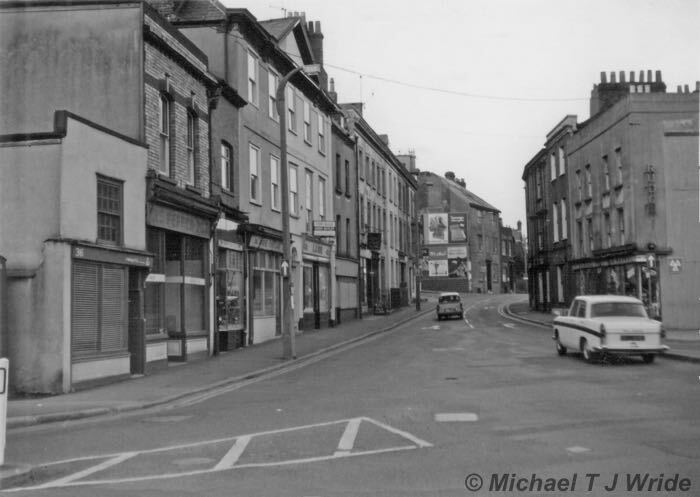 James Street, like Sun Street is one of the lost streets of Exeter. 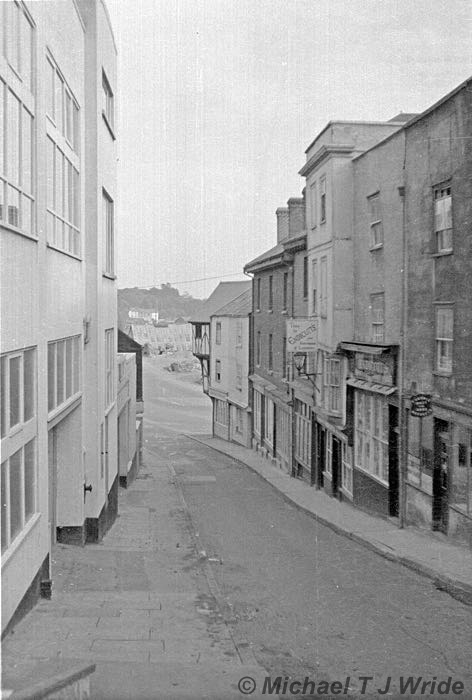 Coombe Street crosses the end of James Street in the photo. The Follett tenement building in Mermaid Yard, and to the left, Central School are on the skyline. Gaytons Garage is in front of the Follett building. 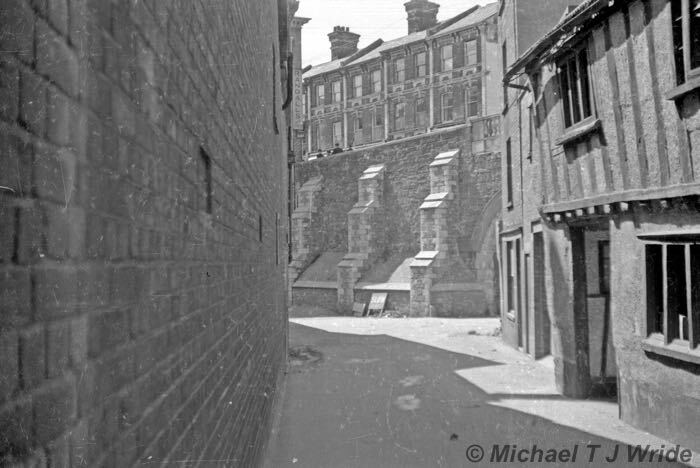 James Street has now succombed to the bulldozer in this photograph. 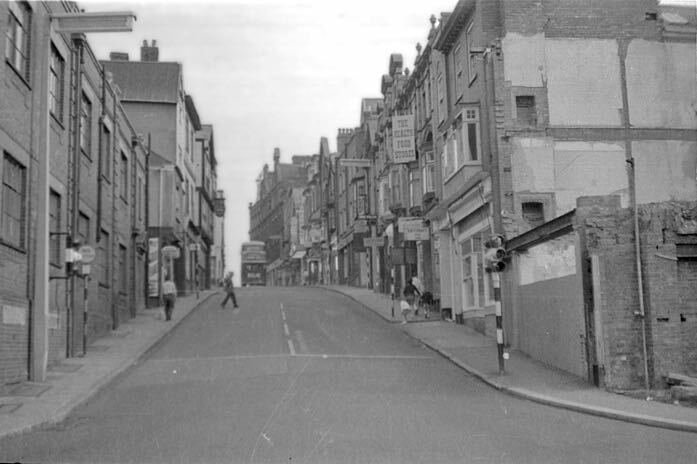 Notice the turn in James Street–the street emerged in South Street by the olf South Gate site. It doesn't seem possible that the left side of Sidwell Street, opposite the Odeon, had still not been rebuilt, 20 years after the blitz. The damage was enormous in some parts, and lack of money and materials slowed the process of rebuilding the 'Ever Faithful' city. 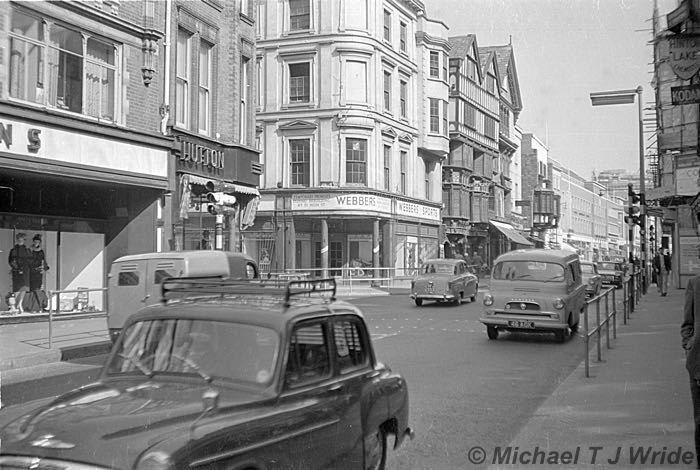 Taken at the same time as the previous photo, the west end of Sidwell Street, looking towards Eastgate (now Next). Many of the buildings at this end survived the blitz and could have been incorporated into the new build, with a bit of imagination and skill. They are now gone, replaced by the turgid, unispiring brick of the 1960s. Indeed, so poor were the rebuilds, that much of the left side of Sidwell Street is to go when the bus station is redeveloped. 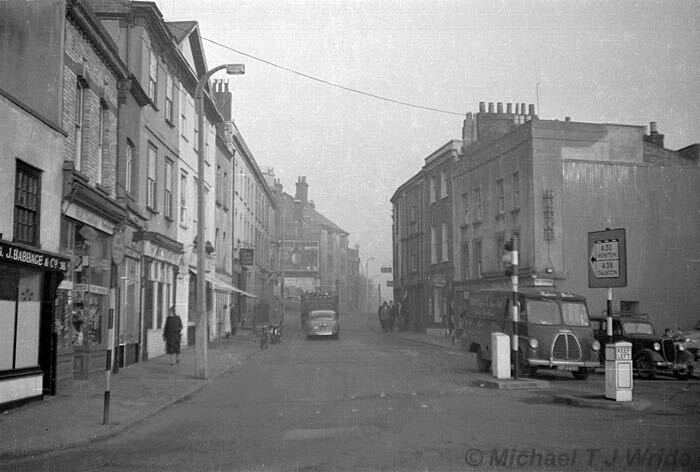 Frog Street before it was lost beneath the West Quarter bypass down to the Exe Bridges. 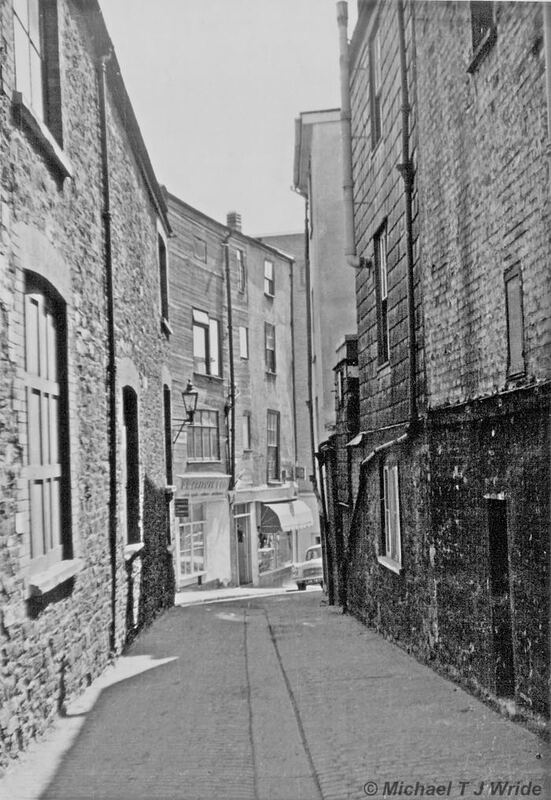 No 15 Frog Street, on the right was built around about 1570, a historic house that was just as important as the "Merchants House (House that Moved). 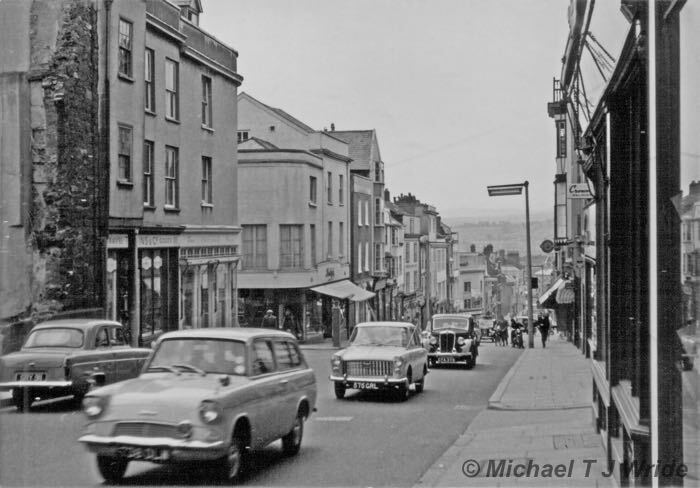 A view down West Street in 1962. 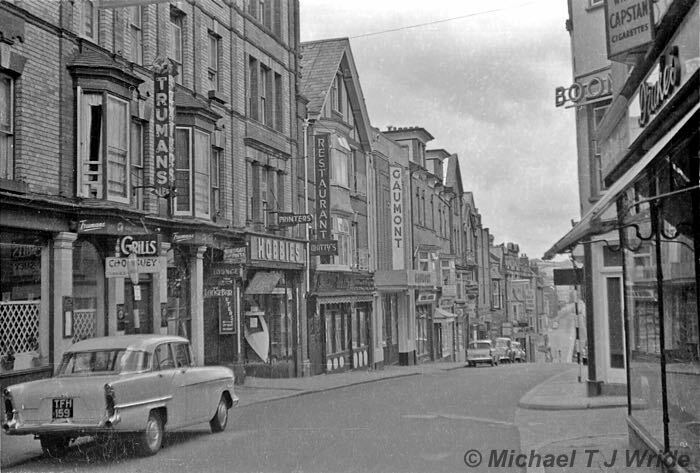 The right hand side has not changed much in the last 50 years, apart from the ccupants of each shop. 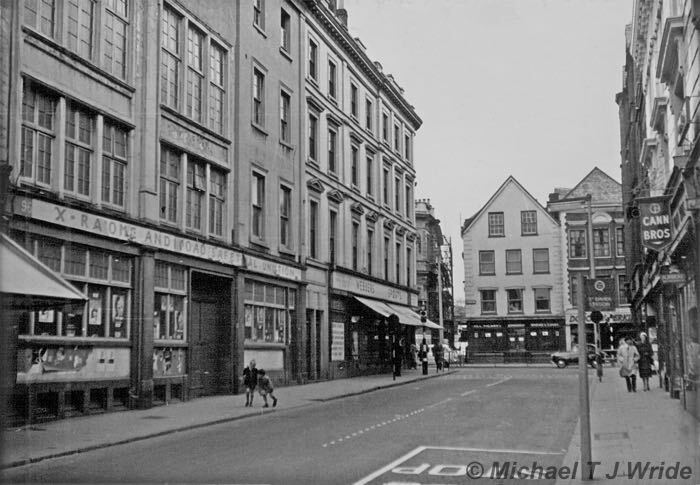 Endicotts, the military and outdoor store that is now on the corner of New Bridge Street was located down West Street at this time–their sign can be seen halfway down the row. 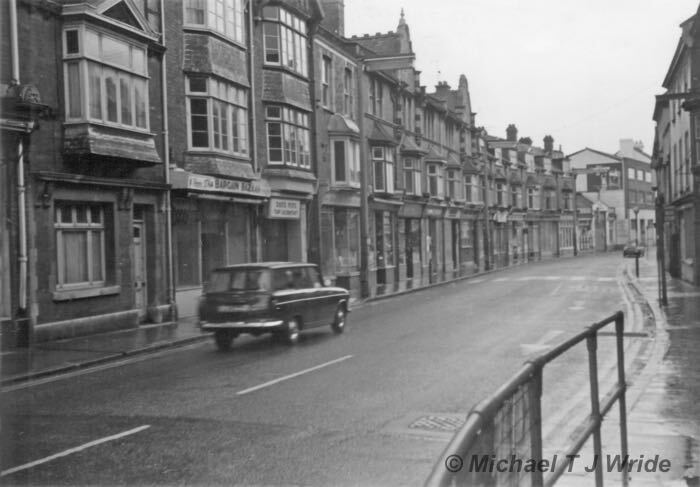 Many won't know that Bonhay Road once joined New Bridge Street just above the Exe Bridge. 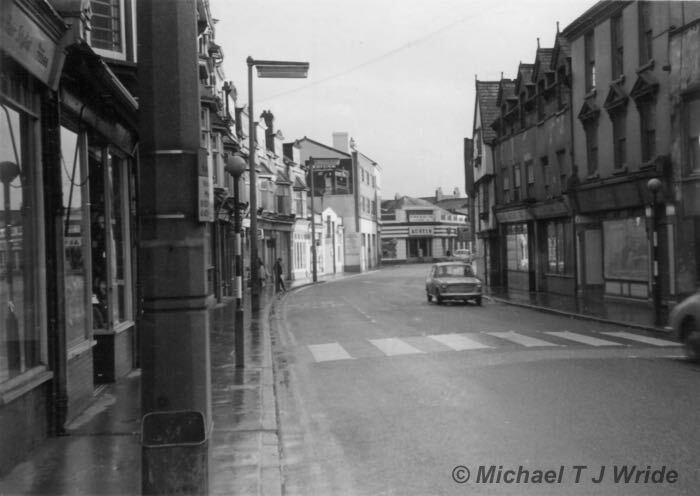 This photo shows the junction, looking up towards Fore Street. Looking down Fore Street on a busy day. 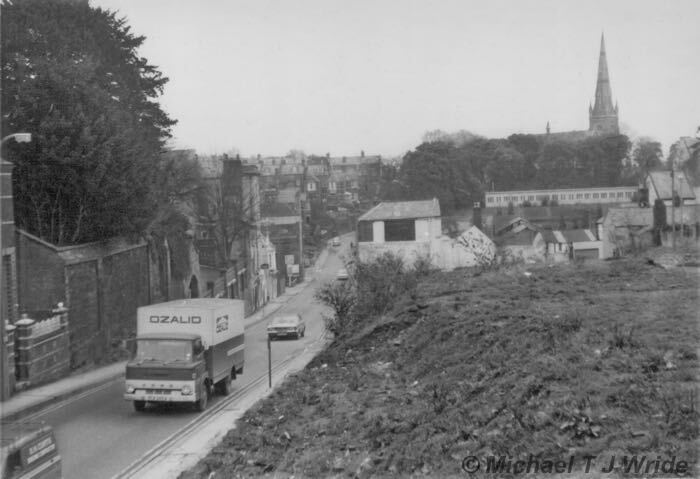 The gap on the left is where St John's Church had previously stood–Taunton Leisure now occupy the site.